Wood boring insects can attack wood within the structure of a building and even the wood within your home furnishings. If left untreated, wood boring insects can seriously weaken timber leading to the eventual failure of the structure of a building. 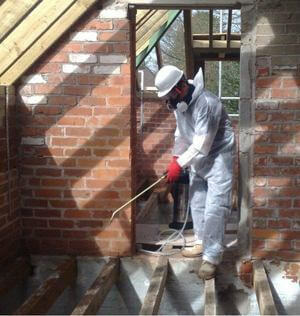 Of course, the early treatment of a small infestation to contain and irradiate it, is always the best approach so be sure to take every opportunity to inspect the timbers in your home and contact a CSRT specialist if you discover anything suspicious. Wood boring insect holes found in timber can be caused by a number of different species. The extent of the treatment required will depend upon the type of species encountered and its effect on the timbers. Solutions can range from a simple drying down techniques, chemical treatments or the replacement of the affected timbers. If you discover signs of wood boring insects don’t panic, this does not always result in sever timber damage and the holes may even have been of a historical nature, and not been active for ove a hundred years. Often our specialist will be able to clearly identify that an infestation is currently active but sometimes we may just advise you to fill (or cover) the exit holes and wait for a year to see what happens. You could fill the holes with beeswax and look for any unfilled holes next year or wrap paper around the beam and see if there is any frass present when you come to check it a year later. This frass can be used to help identify woodworm pests even if the adult insects are no longer visible, as different species form different shaped droppings. For example, the frass of wood-boring beetles is made up of fragments torn off but not consumed, and fragments that have passed through the insects gut – so you’re really looking out for the woodworms poo! For what you would term as woodworm, the frass resembles a fine, powdery dust and is usually found below the area of the infected wood. The frass falls out of old flight holes, when larvae bore through old larval tunnels, hence the build up of material below the infested timber. Of course, although most commonly you will find wood infestations in the UK are due to ‘woodworm’, which is the term applied to the larvae of the common furniture beetle (Anobium punctatum) but it is entirely possible that the holes you can see in the timber in your property come from another wood boing insect, such as the Death Watch Beetle or House Longhorn Beetle. It is for this reason that it really is vital that you invite a CSRT timber specialists, such as Atlantis Damp & Timber Specialists Ltd into your property to ensure the correct identification to allow for appropriate treatment to take place. Although you can take a ‘wait and see’ approach to identifying if your timber infestation is active, we would not recommend to do so if the timber (or timbers!) that you suspect may be infested are becoming weak. Woodworms can cause very severe structural damage and a good probe with a screwdriver or other sharp implement can tell you a lot about how badly a piece of timber is infested. If the wood is soft and the sharp implement can penetrate easily you need to contact a specialist right away to prevent further damage occurring. Our surveyor will investigate fully the source of timber infestation within your property and explore the suitable method of treatment. All of the results and feedback will be provided in a full written report, along with recommendations and details of the cost.